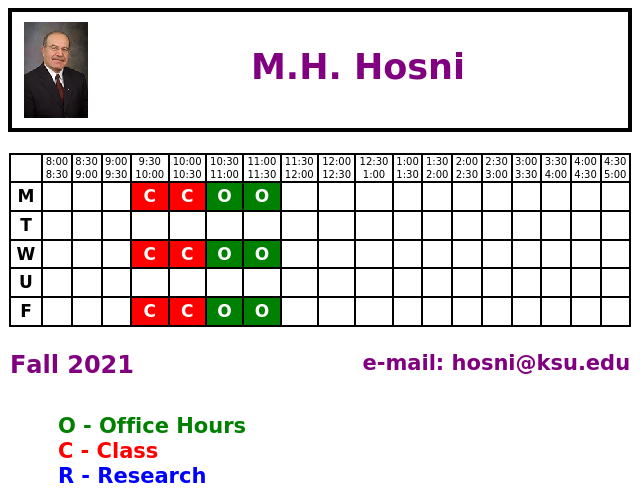 Professor Hosni is a Professor and Director of the University Engineering Alliance at Kansas State University. He joined the faculty in mechanical engineering at Kansas State University in 1991 and in 1993 assumed a leadership role as the director of the Institute for Environmental Research (IER), a multidisciplinary research center at Kansas State, where he was responsible for development of research programs in human thermal comfort and indoor air distribution. He served as the director of IER until 2001 when he was named department head of mechanical and nuclear engineering (MNE). After serving eight years as the MNE department head, he was appointed as the Director of the University Engineering Alliance in 2009. During his tenure at the institute, he oversaw the design and construction of three new environmental chambers and complete renovation of the entire research facility. He was responsible for the growth of extramural research funding to nearly $800,000 per year. His tenure as department head resulted in considerable growth in undergraduate enrollment (490 to 680 students), extramural funding ($3.3M to $5.3M), and development of a distance MS program in mechanical engineering, and rebirth of the nuclear engineering. Dr. Hosni served as the ASME Vice President for Education and currently is serving as a member of the Council on Standards and Certification of ASME. He is also active at ASHRAE, serving on the Publishing and Education Council. Dr. Hosni is the ABET Executive Committee member and Chair Training Committee. Professor Hosni is a Fellow of the American Society of Mechanical Engineers (ASME) and a Fellow of the American Society of Heating, Refrigerating, and Air-conditioning Engineers (ASHRAE). Dr. Hosni's area of expertise is thermal and fluid sciences. He has extensive experience in both experimental and computational evaluation of indoor air distribution, human thermal comfort, uncertainty analysis, and design of experiments. Dr. Hosni has published many technical reports and over 120 articles in peer-reviewed journals and conference proceedings, and has given a number of invited talks and keynote speeches at national and international conferences. Professor Hosni has been principal and Co-principal investigator on over 50 grants and contracts funded by the National Science Foundation, Department of Energy, US Department of Defense, US Department of Transportation ( FAA), Centers for Disease Control and Prevention (CDC), National Institute for Occupational Safety and Health (NIOSH), American Society of Heating, Refrigerating, Air-Conditioning Engineers (ASHRAE), Steelcase North America, Black &Veatch, Ford Motor Company, USAID, Visteon, Boeing, etc. For the past 12 years, Dr. Hosni and his research colleagues have been studying issues of air distribution, human thermal comfort, and gaseous and particulate contaminant transport within wide body mockup aircraft cabin. He has served as a major professor or co-major professor for over 33 M.S. students, and 10 Ph.D. students, and supervised five post-doctoral research associates. Dr. Hosni has been active in teaching, research, and service. He obtained a certificate in Management and Leadership in Education, Management Development Program (MDP), from Harvard Graduate School of Education, Harvard University, in 2006. He also received a certificate in Mediation and Conflict Resolution from Kansas State University in 2001. He served as the Department Head for the Mechanical and Nuclear Engineering Department at Kansas State University from 2001 to 2009. He was the recipient of the Presidential Outstanding Department Head Award at Kansas State University in 2005. Dr. Hosni's research accomplishments include receiving considerable funded research grants from government agencies and industry, publishing over 120 articles in peer-reviewed journals and conference proceedings, giving invited talks and keynote speeches at national and international conferences, and serving as the Distinguished Lecturer for the American Society of Heating, Refrigerating, and Air-Conditioning Engineers Distinguished Lecturer Program. He received recognition for a number of research projects including Best Paper Award and Research Excellence Award. Professor Hosni has taught 15 different undergraduate and three graduate level courses at three different universities. He is a recipient of the Myers-Alford Teaching Excellence Award, and Bob and Lila Snell Distinguished Career Award for Excellence in Undergraduate Teaching. Dr. Hosni has served the university, local community, and professional organizations in various capacities, including a member of the KSU Presidential Search Committee, a Board member and Vice President for CASA (Court Appointed Special Advocate), Chair of technical committees, member of International Advisory Committees, etc. He service recognition includes a Dedicated Service Award from ASME, an Exceptional Service Award from ASHRAE, and the International Educator of the Year Award from Kansas state University.